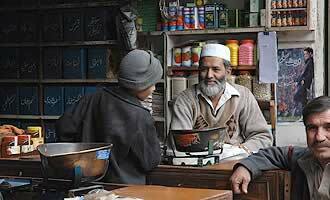 Established more than 2,000 years ago, Peshawar has been the dominion of many empires—from Central Asia, Persia, and the Mediterranean—a trading center along the Silk Road, and the meeting place of divergent cultures and peoples in its markets such as the Qissa Khwami Bazaar. It was the capital of the Kushan Empire during the 2nd century CE and one of its rulers, Kanishka, built a enormous Buddhist stupa here, which drew pilgrims such as Fa Hsien and made the city a prominent center of Buddhism until the 7th century. 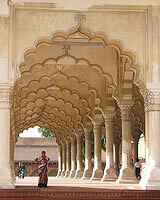 Islam arrived in the region around 1000 CE and remains the dominant faith through today. The city came under Mughal rule when Babur conquered India in 1526 and founded the Mughal Empire. 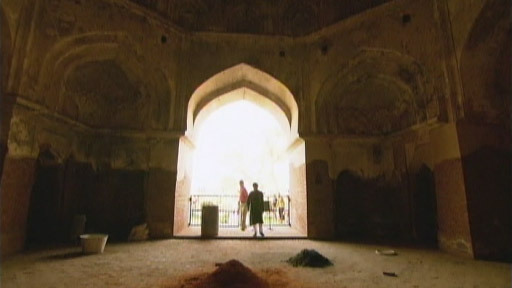 He built a fort here in 1530, and his grandson, Akbar, gave the city its current name. In the mid-16th century, Sher Shah constructed the highway that linked Delhi to Kabul via Peshawar and the Khyber Pass. In 1818, Peshawar was captured by the Indian Sikh ruler Ranjit Singh and then fell to the British. Following independence in 1947, Peshawar became part of Pakistan. Today, it is the capital of Pakistan's North West Frontier Province, which has become a crucial front in the battle against Al Qaeda and the Taliban. From about 200 BCE to 1500 CE, eastern and western traders traveled along the Silk Road, a network of trade routes that linked Rome in the West and Chang'an (today Xian) in the East. Silk, valued for its texture, was a major import of the Mediterranean region, and the Chinese intensely guarded their silk-making technique. However, silk was not the only commodity transported over the route—gems, metals, horses, apricots, raisins, and manufactured goods were also traded. Crossing the route was not without danger, and travelers would often hire guards or rely on local guides to shepherd them on their way. In addition, the road facilitated commerce in technology, art, and medicine—even disease spread across cultures via the route. The network is largely credited with the spread of Buddhism to China, as Buddhist monks accompanied traders traveling east. Later, Chinese pilgrims, such as Fa Hsien, traveled to India to gain access to Buddhist writings and teachings. After the 13th century, the rise of the Mongol empires and regionalism along the route led to decreased use and its eventual disintegration. 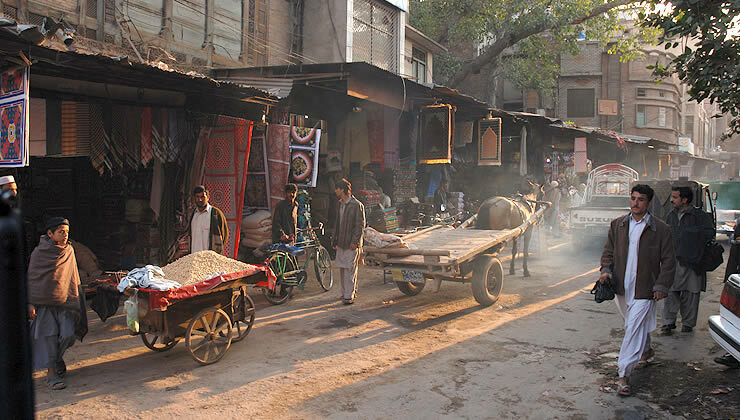 Traders and travelers along the Silk Road, a network of trade routes that linked the western and eastern worlds, would often stop in Peshawar's Qissa Khawani Bazaar, or the "Bazaar of Storytellers," to exchange gossip, news, and stories. Called the "Piccadilly of Central Asia" by a British Commissioner of Peshawar, the bazaar attracted professional storytellers who would recite ballads and tales in the market. Today, visitors to the bazaar can wander among booksellers, fruit stalls, sweet shops, cafes, and restaurants selling fresh breads and grilled meats. Peshawar means "city of flowers" and, as the first major city on the Pakistan side of the Khyber Pass, it has been a crossroads throughout history. In April, 1930, a crowd of unarmed protesters gathered in the bazaar to protest the arrests of Ghaffar Khan, Badshah Khan, and other leaders in India's non-violent opposition movement against British rule. More than 200 people were killed or wounded when British officers fired on the crowd. After the death of Ashoka the Great in 232 BCE, his successors slowly lost their grip on the territories of the Mauryan Empire, and northern India broke up into a number of smaller states ruled by local dynasties. In central India though, a major power continued for over four hundred years: the Satavahana Empire (c. 230BCE-220CE). In the north after a period of internecine warfare, and further incursions and invasions from Central Asia the next great Indian power was created by the Yueh-chi, or Kushans. One of the groups who migrated from what is now Chinese Central Asia into what is now Afghanistan, Pakistan and northern India, the Kushans formed one of the great empires of the classical epoch, ruling at their height from the Aral Sea to the Bay of Bengal. The Kushans built an empire supported by trade on the Silk Road, and lavished their wealth on the arts and on Buddhist monasteries, importing Greek artisans to carve elaborate sculptures depicting the life of the Buddha. This synthesis of western artisans carving eastern subjects became known as Gandharan art. During this era, the first Buddhist missionaries travelled to China, with two Indian monks founding the first Chinese monastery and spreading the teachings of Buddhism by translating its sacred texts into the local languages. 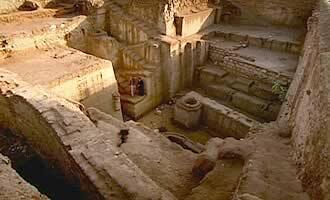 The Kushans practiced an ecumenical rule, supporting many deities of different religions in their multi-racial empire. The greatest Kushan ruler, King Kanishka, closely affiliated himself to Buddhism, choosing the Mahayana tradition, and thereby influencing the direction of Buddhism in China and Tibet. His enormous stupa, erected in Peshawar was regarded as one of the greatest wonders of the Asian world: it was still standing 500 years later, as described by a Chinese pilgrim in the 7th century CE, though only its foundations survived into modern times. The Kushans also developed a highly ornate and sophisticated system of coinage, with beautiful gold coins depicting rulers and gods in superb detail. Along with new inscriptional finds the coinage has allowed modern scholars to date the Kushan ulers more precisely, and is providing new insight into the events of the era which the great 18th century historian Edward Gibbon called "the happiest time in the history of humanity". King Kanishka (reigned c. 127 -147 CE) was the most powerful ruler of the Kushan Empire. An important new inscription found at Robotak in Afghanistan has provided much more information about his family and ancestors, the dates of his rule, and the extent of his vast Indian empire. Having adopted Buddhism, he influenced the direction of the development of the religion by supporting the Mahayana tradition, and sending missionaries to China, where Buddhism then began to flourish. 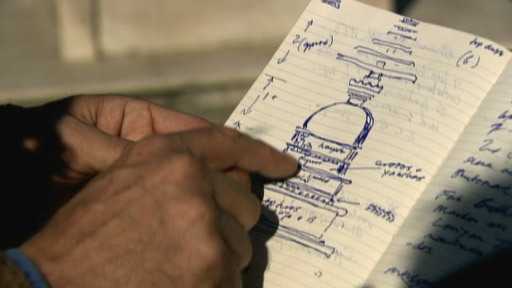 He also built a great stupa in Peshawar that signaled his support of Buddhism. Kanishka continued his campaigns of conquest to enlarge the Kushan Empire, expanding its boundaries from Afghanistan and Central Asia in the northwest, and Kashmir in the north, to Ujain in central India, Mathura, Kosambi and Benares in the Ganges plain, and Bhagalpur in Bihar, only three hundred miles from the Bay of Bengal. According to later legend, Kanishka was ultimately killed by his own soldiers, who suffocated him in his tent. Approximately 33 miles long and 50 feet wide at its narrowest point, the Khyber Pass has been the main route through the Hindu Kush mountains on the border of Pakistan and Afghanistan throughout history. Winding between limestone and shale cliffs, the pass begins near Jamrud, Pakistan, and ends near Torkham, Afghanistan, reaching its highest point at Landi Kotal (3,510 feet). The mountains and high plateaus that form northern India's borders are broken only by several passes, and throughout history, traders, immigrants, and invaders made their way into India using the Khyber Pass. Among them, many scholars today believe, were migrants from Central Asia or the Afghan-Iranian borderlands speaking an early form of Sanskrit (or Indo-Iranian). Though this is very controversial in India today, some historians believe that these newcomers, who called themselves Aryans, or "noble ones," steadily trickled into the subcontinent over several centuries settling first in the lands below the Khyber on the Kabul River. In the fifth century BCE, Darius I of Persia marched through the Khyber Pass to the Indus River after conquering the country surrounding Kabul. Other invaders, including Alexander the Great, Timur, Babur, and Mahmud of Ghazni, also took advantage of the pass's strategic location. Under Ashoka the Great, (3rd century BCE) Buddhism flourished in the region as evidenced by sites including the stupa near Fort Ali Masjid in the pass's southern region. 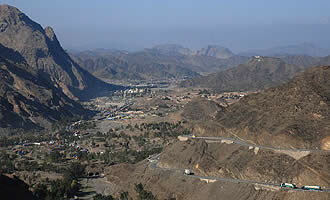 For the British, the Khyber was a critical military location in the Anglo-Afghan wars during the 19th century. In 1879, the British built a road through the pass, and from 1919-1925, a complex railway that includes 34 tunnels and 94 bridges was constructed through the route. As late as the 1970s, extensive camel caravans would make their way down the pass twice a week, bearing rugs, jewels, spices, herbs, and medicine from the markets of Bukhara, Uzbekistan. A route for cultural and linguistic exchange, the Khyber Pass has also been the site of intense fighting and military operations right up to today. The Pakistani Khyber Agency controls the pass today and it is still the major land route for commerce between India and Afghanistan. What prominent roles has Peshawar, Pakistan played in Indian history? What impressive lineage did Babur bring with him to India? What has been the historical role of the Khyber Pass? Which Khyber Pass travelers have caused havoc in Indian history?